California's Bear Valley has no hassle, no scene, no lift lines. Isn’t this why we go to the mountains? You have to wonder: If the French tourists have found Bear Valley, why is it that hardly anyone in Northern California seems to know it’s here? One reason may be that it’s so darn hard to find on a map. Start at the blue orb of Lake Tahoe, drag your finger south along the Sierra, then squint and look for the speck labeled Bear Valley. In winter, State 4 dead-ends just past here at Lake Alpine. It’s a road to nowhere. But there is a ski resort here. Not the biggest, certainly not the flashiest, but make no mistake―with 1,280 acres of downhill skiing, there’s room to roam. And the runs have views across a mountainscape unbroken by show-offy homes or parking lots. This adds to a throwback feel that either you get or you don’t. It’s as if one of Tahoe’s resorts had been scooped up in the late ’60s (loopy I Love Lucy–style logo and all), suspended in ice, then plopped here for you to discover in 2009. And some do discover it. They come because, well, it’s simpler and cheaper than going to Tahoe. They come because nightlife here means coming in frosty-faced from the slopes for an epic game of Yahtzee in front of the fireplace and an early bedtime so they can get up, stretch their legs, and choose between another day of downhill or hitting the tranquil weave of cross-country trails. Saturday is murmured to be the one “busy” day on the slopes. So I walk across the road from the lodge to what is, it turns out, one of the country’s biggest cross-country resorts, with 40 miles of trails. It’s a sparkling morning with 4 feet of fresh snow, and the course is hosting a race. Skiers hit Bear Valley’s cross-country resort for its trails and warming hut. Still, once I’m away from the sunny meadow where families are dragging inner tubes loaded with kids toward the sledding hill and skiers are getting their snow legs on, I’m on my own. Schussing through a pine grove, I hear clumps of snow breaking apart on branches and look up to see white shimmers descending through streaks of sun. Van Morrison tunes come floating by, and I spy a sunny deck where a T-shirted crowd is eating burgers and drinking beer, in no hurry at all to leave the woods. Moments like this, it’s easy to picture the late ’60s here, when, one longtime guest told me, people would dash naked from the outdoor hot tubs to the sauna. 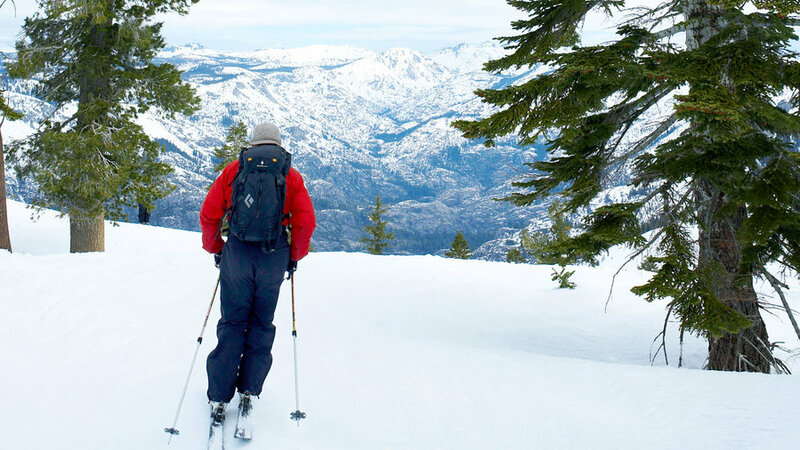 When, for a single, buzzy season, Bear Valley became Club Med’s first-ever U.S. resort. The hot tubs and sauna are gone. So are the naked people, as far as I can tell. And now there’s talk, big talk, about a new village with shops and condos. So come soon. Come this year or come next. But whatever you do, come before this quaint time capsule morphs into Tahoe South. The valley is about a 3¼-hour drive up State 4 from the Bay Area. Even on a busy weekend, the drive rarely breaks four hours, because State 4 is closed at the pass and gets little traffic. The 1967 Bear Valley Lodge (from $99; bearvalleylodge.com) has rooms that aren’t much more than a place to sleep, but it doesn’t matter: Everyone hangs out in the soaring four-story Cathedral Lounge, with a vast fireplace made from granite boulders the size of cars. The four restaurants and two bars won’t win any awards but will keep you fed. Many prefer to rent a nearby condo with a kitchen (from $195; bearvalleyvacationrentals.com); Sundowner is the nicest to date, but check to see whether a new building called Silver Mountain has any of its spiffy 2- or 3-bedrooms on the rental program yet. If you end up in one of the older condos―Creekside or Condo Bear―call to ask the rental agency which have been updated and which haven’t. Unless you have a thing for shag carpeting and macramé. The cabins and vacation homes scattered up on the ridge offer great views and quiet. They’re accessible only by snowmobile, and a whole fleet tricked out with kid seats and luggage trailers stand ready in the village. The Sunday-morning rush to leave Tahoe doesn’t really exist here. Take your time and enjoy the day before heading down the mountain. If you’re going to the Bay Area, when you get down near Stockton, regulars say that detouring around I-205 by taking State 99 south, then State 120 west will avert most Sunday delays.